￼IAVA has continuously leveraged our relationships with the film and entertainment communities — from partnering with to producing films that engage the veteran community and help bridge the military-civilian divide. These Academy Award-nominated and critically acclaimed films have ranged from independent documentaries to commercial blockbusters. 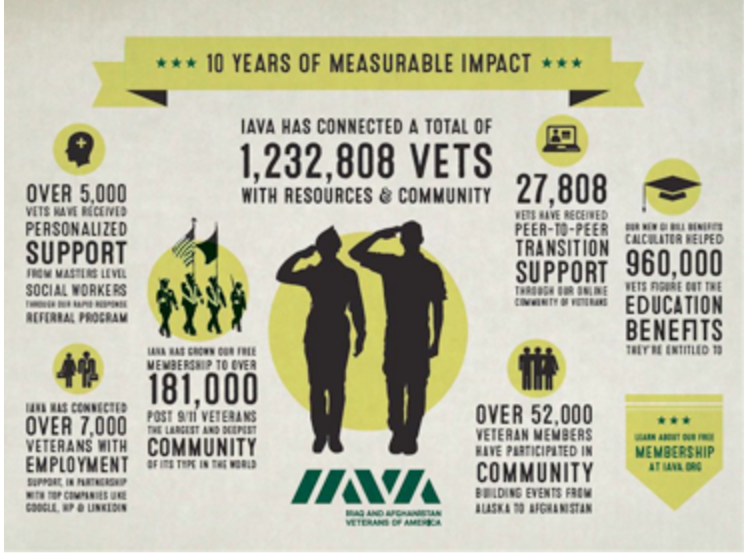 For over a decade, IAVA has defined the national conversation on veterans and been the true thought-leader globally. We don’t just support veterans, we empower them. And no organization does it better—with over 400,000 members nationwide. IAVA has advised the White House, Pentagon and Congress, dominate media coverage around veteran’s issues and regularly receives top ratings from Charity Navigator and others for our effectiveness and efficiency. No group does more with less. And no other veterans group in America has more experience—and more success—in leveraging film and entertainment projects to make a difference. IAVA recognized soon after our founding in 2004 that film and entertainment projects had a unique power to define our experience and activate millions. Films connected to Iraq and Afghanistan, for better or worse, would tell our story to the world forever. When the average American is asked about Vietnam, the first reference they have is films like Platoon, Full Metal Jacket, Deerhunter, Born on the Fourth of July, Forest Gump and Hearts and Minds. Decades from now, IAVA supported films will do the same. And as the leader of the leader of the 9/11 veterans community, it is our responsibility to support and validate the best, and serve as a watchdog against the worst. IAVA also provides historical, technical, cultural, social, financial, technological and programmatic support that can ensure a project maximizes its impact—and does no harm, by taking care of the veterans and supporters long after the film is over. IAVA provides valuable best-in-class resources and empowers veterans to connect with one another, fostering a strong and lasting community. Through education, advocacy and community building, we strive to create a country which honors and supports veterans of all generations. IAVA is the voice of the 2.8 million veterans of Iraq and Afghanistan, raising awareness in the media, on Capitol Hill and among the general public at hundreds of events on the ground nationwide every year. We address critical issues facing new veterans and their families, including mental health injuries, a stretched VA system, inadequate health care for female veterans and GI Bill educational benefits. IAVA is also a media and social media powerhouse, with over 100 trained spokespeople, an extensive internal communications, PR and marketing team and over 500,000 likes on Facebook on and 50,000 Twitter followers. IAVA’s Board of Directors includes Hollywood powerhouses like World War Two Veteran Norman Lear and Lone Survivor Director Peter Berg and influencers Dancing with the Stars Champion J.R. Martinez and WME and IMG President of Global Sales and Marketing, Greg D’Alba. -Validating films for and about the veteran community, especially for post-9/11 veterans. IAVA spokespeople are the go-to for the media, business and government. -Hosting VetTogether screenings across the country from Hawaii to Maine with IAVA’s over 400,000 members. -Integrating best-in-class veterans service programmatic support, with IAVA’s Rapid Response Referral Program (RRRP), which provides one-on-one support from masters-level social workers in 48 hours or less for veterans nationwide on issues ranging from homelessness to financial trouble to mental health/suicide. The program has served over 5,500 veterans in just the last two years. –IAVA’s powerhouse Advocacy office in Washington, DC has extremely strong relationships and tremendous influence on all things veterans, working on both sides of the aisle in the House and Senate and especially with the Senate and House Veterans Affairs Committees. IAVA also works closely with the Department of Defense, Department of Veterans Affairs, Arlington Cemetery and the White House. In addition, IAVA is the Chair of the Communications Committee for The Military Coalition—comprised of 31 of the nation’s top organizations representing over 5.5 million members of the uniformed services—active, reserve, retired, survivors, veterans and their families. IAVA regular testifies before Congress and recently lead the creation of the bi-partisan Post-9/11 Veterans Caucus. –IAVA Research. IAVA’s powerful Research Department uses real data to drive the development of scalable solutions to benefit veterans and their families. Led by Dr. Jackie Maffucci, PhD, IAVA Research utilizes careful analysis of our members and partners to inform the nation with the best possible information on issues ranging from VA wait times to rates of unemployment. The department produces special IAVA Issue Reports on issues like Women Warriors: Supporting She Who Has Borne the Battle and Invisible Wounds: Psychological and Neurological Injuries Confront a New Generation of Veterans. IAVA’s Annual Member Survey is the largest non-governmental survey of confirmed Iraq and Afghanistan combat veterans. It asks our members about their experiences with reintegration, health and mental health, employment, education and asks how the government is doing to support them and their fellow vets. -Fundraising campaigns for IAVA’s programs, which support nearly 350,000 veterans and their families nationwide and give audiences a way to give back. –The War Tapes (2006), Tribeca Award-winning documentary. One of the first and best films about the war in Iraq, IAVA served as a technical advisor and validator, hosted house parties nationwide, included featured characters in IAVA panels and events, and authored supportive articles with partners including HuffingtonPost. Distributed thousand of DVDs, supported broadcast premier on CNN. –The Ground Truth (2006), Sundance award-winning documentary by Patria Foulkrod. IAVA raised over $20,000 of initial funding for the film, helped the filmmaker find almost all veteran subjects, reviewed edits, conducted outreach, hosted IAVA-sponsored screenings, attended film festivals and red-carpet events, executed extensive social media outreach, distributed and sold thousands of DVDs. Interviews with Paul Rieckhoff and other IAVA leaders are featured in the film. –Charlie Wilson’s War (2007), Written by Aaron Sorkin and starring Tom Hanks, IAVA supported the film based on the life of the former U.S Congressman who worked with the CIA to support the Afghan mujahideen during the Soviet-Afghan war. Working closely with Take Part, the social action platform for Participant Media, IAVA sponsored house-party screenings of the film nationwide and hosted a conference call with IAVA CEO Paul Rieckhoff, Nathaniel Fick the best selling author of “One Bullet Away: The Making of a Marine Officer and Charlie Wilson Himself. Tom Hanks recorded a robo-call to all IAVA members and an introduction and welcome message to all call participants. IAVA was a charitable partner and helped created the “Social Action Campaign” for the film, which included a way for viewers to sign a petition and take action to pressure legislators in support of the People’s Treaty to Ban Cluster Bombs. –Green Zone (2010), Directed by Paul Greengrass, starring Matt Damon. A major motion picture based on Rajiv Chandrasekaran’s best-selling book, IAVA held casting calls at IAVA HQ in NY, resulting in about a dozen first-time actors being selected to appear in the film—including a cameo by IAVA founder Paul Rieckhoff. IAVA leaders attended and supported red carpet screenings. –Restrepo (2010), Sebastian Junger and Tim Hetherington’s Sundance-selected, documentary produced in association with National Geographic. Partnering closely with Sebastian and NatGeo, IAVA members attended premier events and IAVA hosted special advanced screenings for IAVA members in multiple cities. Conducted press outreach and provided program support. IAVA program partner, The Veterans Crisis Line (VCL). IAVA conducted extensive media and social media outreach and hosted an event on Capitol Hill in Washington featuring the IAVA-created Post-9/11 Veterans Caucus and Co-Chairs Congresswoman Tulsi Gabbard (D-HI) and Congressman Dan Perry (R-PA). IAVA is a leader in bringing together Republicans and Democrats and in convening events to promote IAVA partners and products. –American Sniper (2014), Directed by Clint Eastwood. IAVA provided early content feedback to the Warner Brothers and American Sniper team on messaging, outreach and program support. With Warner Brothers, hosted IAVA advanced screening events in 15 cities coast to coast. Extensive social and earned media outreach. Press releases supported the film as “the single best work of film about the Iraq War ever made.” Attended red carper premiers and conducted media interviews in support of the film in NY and Washington, DC. Media highlights include a feature review piece by IAVA’s Paul Rieckhoff on the front page of Variety and appearances on CNN’s Reliable Sources and Tonight with Don Lemon and Comedy Central’s The Nightly Show with Larry Wilmore. –Fort Bliss (2015), A powerful independent film about a female combat medic, IAVA was a close adviser and chartable partner. IAVA was featured on the film’s homepage and assisted in outreach for screenings and helped train Michelle Monaghan, the star of the film, to talk more effectively about women’s veterans issues. IAVA also hosted VetTogethers for the films in multiple cities, welcomed Michelle as a guest of honor at IAVA’s annual Heroes Gala in New York and conducted extensive social media promotion and outreach. Michelle continues to be a passionate advocate for IAVA and female veterans in particular. –Max (2015), IAVA worked closely with Warner Brothers and MGM on hosting over 39 IAVA-sponsored, family-friendly Max VetTogethers from Hawaii to New Hampshire. IAVA program support was fully integrated into every event—and online. IAVA members provided real military working dogs at dozens of events, and extensive social media jump-started public support for the film and generated excellent earned media. Max himself joined IAVA for a Memorial Day VetTogther “Instameet”, in partnership with Instagram, on The Mall in Washington, DC. VA Secretary Bob McDonald attended another event in Washington, as did Max star Josh Wiggins in Houston, Texas. War Machine (2017), IAVA worked with Netflix and Plan B Entertainment to partner on the release of the film. IAVA held a special screening for IAVA members with War Machine star Anthony Michael Hall in New York City ahead of Memorial Day. IAVA also hosted an online “Facebook Live” event with Anthony Michael Hall to educate and engage the public on the most important issues regarding the ongoing conflict in Afghanistan, the sacrifices of our military in the post-9/11 world, and pressing needs of over 3 million returning veterans. –DUNKIRK (2017), IAVA partnered with Warner Bros. to drive a national conversation about military service. DUNKIRK, a new film from Warner Bros. and Director Christopher Nolan is based on the bloody and gripping story of an epic World War Two battle in 1940. A testament to the heroism of countless courageous servicemembers and civilians who fought, died and survived this battle of mammoth scope and importance the film tackles questions and draws attention to urgent issues millions of servicemembers and veterans still face today. The Sandstorm, 2005. Written by, produced by and starring Iraq vet and IAVA member Sean Huze, The Sandstorm was a play that premiered at the Elephant Asylum in LA and in Washington, DC at MetroStage. IAVA provided financial support, technical guidance, media outreach and program information at all events. IAVA donor Charlie Fink underwrote the Washington, DC production after an IAVA introduction. Grounded, 2014. Produced by Julie Taymor and starring Anne Hathaway, IAVA was the exclusive chartable partner and technical advisor to the groundbreaking play depicting the story of a female Air Force UAV (drone) pilot that ran at New York’s legendary Public Theater. IAVA connected the producers with IAVA Legislative Associate and UAV pilot combat veteran Lauren Augustine. Lauren helped Anne understand what life was really like for the character—and provided technical assistance throughout. IAVA also assisted in outreach to the military community for the premier, was featured in the Playbill and posted volunteers with program information at all showings. Are you interested supporting IAVA’s Film Programs? Click here to submit a partnership application.